Once again we are confronted by the good and the bad. 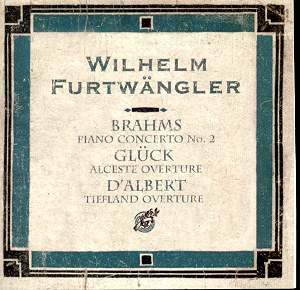 As I’ve noted repeatedly, if not exhaustively, throughout my reviews of this series of Furtwängler’s wartime material any dubious performances were not included in DG’s own boxes of these performances. Melodiya’s policy has been to acknowledge the difficulty, protest that these are nevertheless overwhelmingly likely to be legitimately his performances, and plough ahead regardless. I remain as unconvinced as ever by this approach, which is one that may very well confuse the uninitiated especially as the questions are addressed in the poorly translated notes and not on the jewel box itself. This question relates specifically to the Tiefland overture. The conductor did most certainly conduct the opera earlier in his career but no evidence has been presented of which I’m aware that this 1944 performance of the overture is by him. As Stenka Razin, and the Haydn symphony, purportedly Furtwängler performances, have now been shown not to be by him, it would be wise to exercise similar reservations over this performance. It’s well played and equally well recorded but almost certainly not by the conductor. He recorded the overture to Alceste commercially in Berlin in 1951 and a Vienna performance from 1954 has also survived. There’s quite a high ration of hiss on this one but that’s outweighed by the big-boned approach and the romanticist instincts in full cry. There’s a touch of pitch instability at the end and the rather constricted sound is a limiting factor, more so in fact than the hiss. The truly important performance obviously is the Brahms. This has been reissued a number of times and is one of the most dramatic and powerful inscriptions on record. Its virtues are well enough known – and all the more so when one contrasts it with the surviving performance Furtwängler gave with Aeschbacher the following year, an altogether less inspired meeting. Certainly the sound is splintery but the performance is titanic, involving and all-embracing in its emotional complexity. Fischer is a soloist of intense and spontaneous-sounding dynamism and his finger slips are of incidental significance. His playfulness alternates with thunderous power and gravity. The demands of the concerto are met with symphonic conviction and the finale’s reconciliatory lightness is, in these hands, a perfect summation of the nervous power that had preceded it. This is one of the most miraculous of the wartime survivals and a highlight of the series. It’s been on the relevant DG box and most recently on Testament where it’s coupled with the conductor’s Adagio (Symphonic Concerto) in the 1939 commercial recording made by the two men in Berlin.